I also have a dark blue color and I use it everyday. The unit price seems to be good, but as the number of people goes to everyday, the amount will be much. I would be happy if you could make it cheaper. 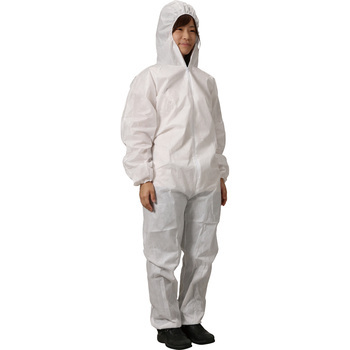 I wondered whether yukke or protective clothing, but I bought this time thinking of cospa this time. I wish had sale of upper and lower sets of yakke. The dark blue color is saved because dirtiness is less conspicuous. The price is also handy for convenience and disposable. I wanted a jacket with zipper Because it was not, I cut this product with scissors and used it as a jacket. It is hotter than Yakke, but it is hot as the wind does not pass. Even if urethane is attached directly, I think that it was good because it did not adhere to the inside clothing. Because it is painful to wear off, so it can be a little expensive so it will be appreciated if you can also sell jackets with fasteners. This review is about item#61017661. Even in short sleeves, even when wearing long sleeves, I wear this, I am doing a Sunday mechanic. If this clothes is also dirty of oil, it puts out one cushion and it is saved. Car chassis black to paint! Although it is disposable, there was a durability, there was a reasonable cost, it was cheap enough and it was enough! I also want to buy! There are no complaints in that it is cheap and easy to wear. If you buy it by matching the size, it is cramped at the time of work, even M size people use LL. It was stronger than I expected. I was able to use it even after washing once. It becomes light cold weather and windproof for cold nights. It is light and easy to move, and it is very good that it is low fee in any way. It's dirty work so you do not have to think about making it last longer.